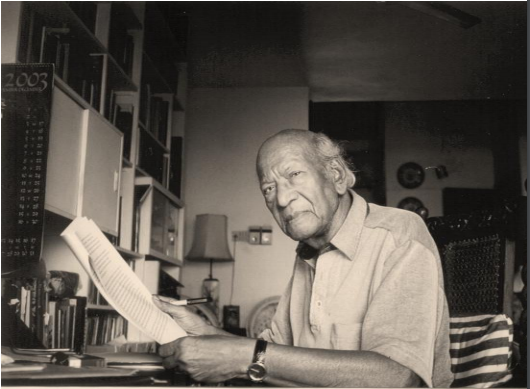 On 1 Feb 2019, an event commemorating the life and works of noted film historian and filmmaker Bhagwan Das Garga is being hosted by Lightcube, a New-Delhi based film collective, at the British Council. Titled, ‘Modern Antiquity: The Garga Archives’, the event marks the second cycle of The Garga Archives, a digital archive which features a collection of articles written by Garga, published in cultural and film magazines that are now defunct or unavailable for readership; unpublished pieces; rare correspondences with filmmakers, archivists, historians, cultural activists and acquaintances; along with a gallery of exclusive photographs and digital copies of his films. The evening will feature a session called “The Collaborator”, reminiscing the life and work of B.D. Garga, who was a pioneering documentary filmmaker, a respected film historian and one of cinema’s true internationalists (BFI). Aruna Vasudev and Shantanu Ray Choudhury, both friends and collaborators of B.D. Garga, would recount their memories of the filmmaker in this session. The programme also includes a screening of B.D. Garga’s film Glimpses of Indian Cinema (1963), along with an exhibition curated jointly by Lightcube and IGNCA. Initially conceived as a book project, the archives took shape as a digital website, as a mode for the creators to engage with questions of easy accessibility, cost and viability of production. The website, according to curator and uploader of The Garga Archives, Anuj Malhotra, bears testimony to the “glorious multiverse, where a set of individuals, institutions and communities were engaged in the active cultivation of what one may now term, film culture”. 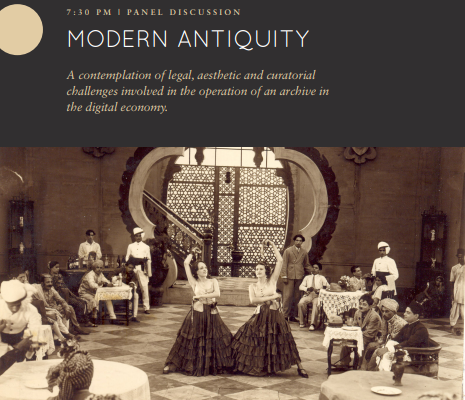 Kanika Katyal of the Indian Cultural Forum speaks with Anuj Malhotra(curator and uploader) and Suraj Prasad (the web architect) about their vision of the archival project, what informed their curatorial process and the complexity of ownership in cultural ventures. Kanika Katyal: How and when did you decide to take up a digital archival project on BD Garga? Anuj Malhotra: In 2011, Gautam Valluri and I had the privilege of assisting on the design of BD Garga's very final book before his death – Silent Cinema in India: A Pictorial Journey (it won the National Film Award for the Best Book on Cinema in 2012). The conversation extended to the following years, with the publishers of the aforementioned book very enthused in the idea of a sequel, another book of photographs set in the studio era. Our services as designers were engaged again, and as we continued to work over three years (2013-15) to develop this book, we had the opportunity of remaining in constant communication with Mrs Donnabelle Garga – which really is when our exchange about B.D. Garga's life and times began to assume any discernible shape. It was never the intention originally to have all the material cohere into a single, coherent archive. Instead, the reason Mrs Donnabelle Garga even began to rummage through her ancient collection of files, the attic, her library, drives on her computer, the perennial old trunks, etc., was because she was very invested in being able to free up space in her house and also since she noticed our curiosity about B.D. Garga and his work. I suppose this obliged her to share with us rare material that in her opinion could satiate our idealised vision of the world. So, when we had a chance to access all of the valuable, exceptional material: hand-crafted letters, a whole diary of notes on unfinished films, a battery of technological equipment – that the very real danger of having all of it lost to invisible oblivion dawned upon us. As such, however, there was never a single, accumulated source – a room, say – that we walked into and picked what we wanted. The archive was sutured for us by Donnabelle, piece by piece, bit by bit, exhibit by exhibit – and of course, in any archive worth anything, there cannot be any discrimination then – it is all important. KK: What are some existing or past archives that you drew references from – aesthetically, and politically, both local and global? AM and Suraj Prasad: We were very aware of the archives devoted to the work of cineastes we idolise – especially, to film critics Raymond Durgnat and Serge Daney, but also one to Stanley Kubrick – and wished very much to erect one in the same tradition to the figure we think is one of three or four of India's primary cinephiles. In terms of the political aspect of it, I think the Archives exists as a manifestation of the collective's efforts to facilitate open access and availability of historical documentation, archival material, obscure artefacts, fringe data, mythological narratives, alternative thought-streams and folklore to a section of the population or citizenry who may have otherwise not had an opportunity to engage with these. To us, this is central to the exercise of social upheaval – or at least, the gradual thawing of its coagulated hierarchies of power. KK: What was your curatorial process informed by? AM and SP: The process of selection or curation per se is owed largely to the manner in which much of the material was procured. During the period of our interaction, Mrs Donnabelle Garga had begun to digitise by herself much of the material available to her. It is because of her judicious work, a wealth of material, howsoever disjointed and scattered, that we diagnosed the possibility of an actual, real archive – a mausoleum, if there ever was one. For the process of cataloguing and in order to prepare our index (the digital archive was originally intended to be a printed book), we looked at the editorial strategies adopted by various monographs on filmmakers published in India in the 1970s, but now out of print. These included IFFI catalogues from the 1980s (exceptional; rich illustration, rich insight), Pradip Biswas' thin book on Yilmaz Guney but the most essential, and one of the most crucial publications on film in India, the book meant as an epitaph to filmmaker Sukhdev, edited and compiled by Jag Mohan, called The Documentary Montage. The structure of the website was meant to resemble, a detective investigation, with all of our clues organised in clear detail – but the discovery of this final publication served as very useful validation. As such, the website will now feature, primarily, five sections: a brief, factual history of his life, pieces by him, pieces on him, a gallery of photographs, and correspondences. KK: Would you like to reflect on the notion of ownership involved in such cultural ventures? AM and SP: I can sense that there are a series of successive ownerships one can identify here: creative, memorial, cultural, imaginary, archival, curatorial, scholarly, cinephilic (and extending outwards, to perhaps the reader of this interview as well) – but I would venture, that unlike material wealth, this plural ownership does not yield in its wake an exclusive, or feudal set of inheritances, but instead, a rather utopian, ideal, shared lineage. This is perhaps manifest in an adage commonly employed but seldom mulled, '…the film, or the song, enriched me…' – this is to say, there are as many owners of a cultural object as there are those who came in touch with it. KK: Are there more such archival projects in the pipeline? We are attempting, at the moment, to forge a network of diverse archives and museums (or at least, smaller, more contained efforts that may exist as miniaturised versions of the same) which will, we hope, radiate from the effort of The Garga Archives. The first digital museum exists for us as a means to radiate into and fill fully this glorious multiverse where a set of individuals, institutions and communities were engaged in the active cultivation of what one may now term, film culture. This will, therefore, involve the deployment of B.D. Garga – and his figure – as a conduit, a guide, so to say – who will help us illuminate other, similar figures, whose activity or kinesis we will then attempt to distil in a set of microsites. This is not different, of course, from a chemical laboratory where various specimens are stored for eternal observation through their placement in formaldehyde; a museum, in effect, of the long, gone, but paradoxically, still alive. This larger effort will entail, quite necessarily, a massive digitisation effort, a set of elaborate coding exercises and finally, of course, the sensitisation of a prospective audience to this collection of relics. Anuj Malhotra is the founder of The Garga Archives, a film critic and programmer from New Delhi. He handles the publications for Lightcube and has collaborated with the Sundance Film Forward Programme, Ghent International Film Festival, International Film Festival of India, Pravo Ljudski Film Festival, among others. Suraj Prasad the founder of The Garga Archives, a cinephile, actor and creative technologist. A recipient of the ARThink SouthAsia Fellowship 2018, he is a published film critic and heads The Dhenuki Cinema Project. He is a member of NETPAC.